deloreangarage has no other items for sale. Buy direct from the Author! I'm a huge Delorean fan and was extremely pleased with the product and goodies! A+ EBay Seller! One of the best books out thereAbout this very special Car. Crazy fast shipping can’t wait to read this while sitting in my deelow! Great DeLorean car book - well packaged - signed with bonus memorabilia. Barrie Wills, as one of the earliest employees of DMCL (DeLorean Motor Cars Limited, the Northern Ireland subsidiary of DeLorean Motor Company) therefore has a unique perspective on the DeLorean story. He starts off the book as he is bring courted by John DeLorean to become the Director of Purchasing (later to also include Product Planning) for the fledgling company and concludes some four or so years later as he hands off the keys to the factory to the auctioneer tasked with dismantling what he had just played a major role in creating. His narrative shares the credit where due among hundreds of the other employees, contractors and suppliers in England, Northern Ireland, Italy, the USA, Norway, Germany, the Republic of Ireland and more. The richly illustrated story he recounts puts faces with the heretofore mostly unknown names that were the driving force behind getting John DeLorean's stainless steel, gullwing car from a concept car to mass production, a greenfield site to the world's most advanced auto assembly plant completed in a record 28 months. This book is the story that the DeLorean owner and enthusiast community has been wanting for years. It neatly fills in a number of gaps and corrects some longstanding myths perpetuated by some of the other DeLorean books, as well. All in all, a excellent reference written by a man who was there at the time - highly recommended! You may know how DMC started and ended, this book fills in what happened in between. I was offered the opportunity to be involved with the publication of this book and I have enjoyed reading the book and becoming a friend of the author in the process. Barrie Wills, as one of the very earliest employees of the DeLorean Motor Cars Limited (hired directly by John Z DeLorean) has a unique perspective on the dream of the stainless steel sports car built in Northern Ireland rose from peat bog to handing over the keys to the auctioneer when it all fell apart. 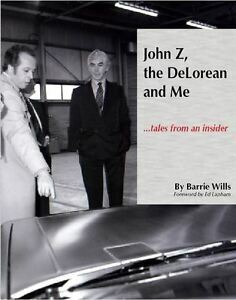 The reader gets a true sense of the enthusiasm and optimism that surrounded the entire DeLorean project and in the process, forms a relationship with the author - I think many readers will also feel that they know Barrie Wills and many of the other people described and mentioned in the book. Even though most readers will know how the story "ends" before opening the book, the feelings of loss, disappointment and outright bewilderment at how the project ended so abruptly and in such a devastating manner for all the people they've come to know from the book really makes the reader feel as if they are part of the story, as well. The historical details and photos about the development of the car, build-out of the factory, adding staff and eventual production of 9,000+ DeLorean cars will be referenced within the DeLorean community forever. The layout, design and printing of the book make it attractive enough to be on display in your home or office - but don't loan it to anyone! A book this good may not be returned to you! Real, deep, must read! Nice hardcover, ideal gift for the DeLorean owner! A brilliant history of the forming of DMC and the building of the plant in Belfast which led to the production of one of the world's most iconic cars. Wonderful chronicle of it's sad demise written with humour.